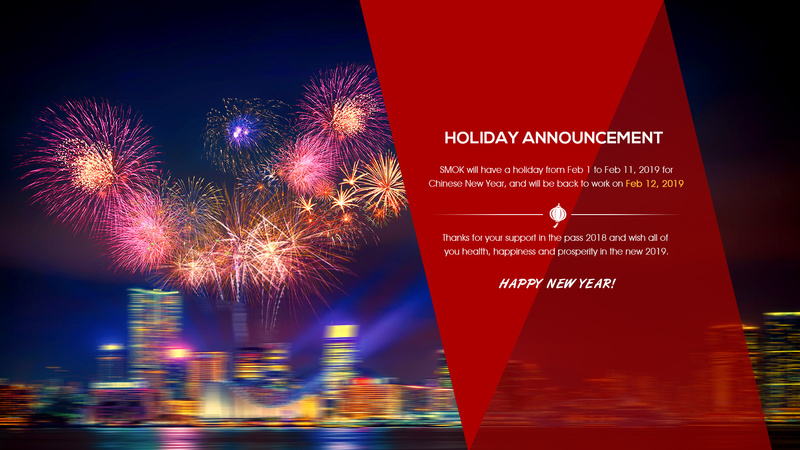 Spring Festival Holiday Announcement - SMOK® Innovation keeps changing the vaping experience! Thank you for supporting us always. Spring Festival is coming, SMOK will have a holiday from Feb 1 to Feb 11, 2019 for the Chinese New Year, and will be back to work on Feb 12, 2019. All orders (on SMOK official website: https://store.smoktech.com/) and messages received between 1st-11th February will be processed on 12th February. Sorry for the inconvenience and we will send you a RBA coil as a gift. During this period of time, you can still message us or send E-mail to support@smoktech.com or submit warranty claims at https://www.smoktech.com/support, a slight delay of reply will apply to all of 3 platform. We will get back to office on 12nd February and start checking & replying your feedback immediately. Sorry for the inconvenience and we appreciate your kindly understanding.